We know that Morris valued being educated at Marlborough College mostly for the rich variety of prehistoric monuments in that part of the country, and his utopians early on in News from Nowhere conversationally engage the visitor from the past, William Guest, on his ‘archaeological natural-history side’. So I conclude that Morris (and Guest) might share my sadness in learning that Channel Four is to axe its flagship archaeology programme Time Team, which has been running on our screens since 1994. 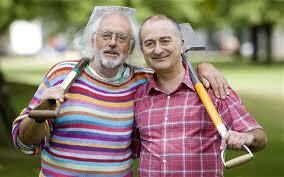 With Tony Robinson as its hyperactive frontman, and the shaggy-haired Professor Mick Aston in his trademark multicoloured jumper leading a trusty band of eccentric archaeologists, Time Team achieved the unlikely feat of making archaeology into popular television. My eight-year-old son and I watched it enthusiastically from the beginning and it kept us gripped for years, though perhaps becoming a little formulaic eventually. There was even a certain politics to Time Team. I wouldn’t call it Marxist, but Mick Aston’s historical sympathies were certainly always with the lowly and humble rather than with the aristocrats, and Tony Robinson was at one point a member of the Labour Party’s National Executive. Moreover, there was a latent socialism to the form as well as the content of the programme in the utopian image of cooperative labour it afforded, as this gaggle of learned eccentrics meshed in the course of each episode and the series overall into a dynamic collective entity (such as Ruskin and Morris imagined labour on a medieval cathedral to be). So: Robinson, Aston, Phil Harding and trowel, field archaeologist Carenza Lewis, Victor Ambrus of the beautiful pencil sketches, historian Robin Bush, John Gater the geo-physics man, Stewart Ainsworth the batty theorist, Mick the Dig – all memorable figures of my son’s childhood cultural world – we bid you a sad farewell. And on 14 September 1881 (according to Nick Salmon's WM Chronology) we find Morris doing his own Tony Robinson or Mick Aston impersonation: "Morris gave Jenny and May a talk on archaeology in Kelmscott Church" (p.112). Are you paying more than $5 per pack of cigarettes? I buy high quality cigs over at Duty Free Depot and I save over 50% on cigarettes.